A Sort is the list through which the order of objects is held. Through the Advanced Post Types Order a sort can apply for any content type or conjuncture of single / multiple custom post types, a mix of custom post types, using taxonomies, authors parameters etc. Once the plugin deployed, at least one Re-Order Interface should be set for Show through plugin settings area at Settings > Post Types Order. 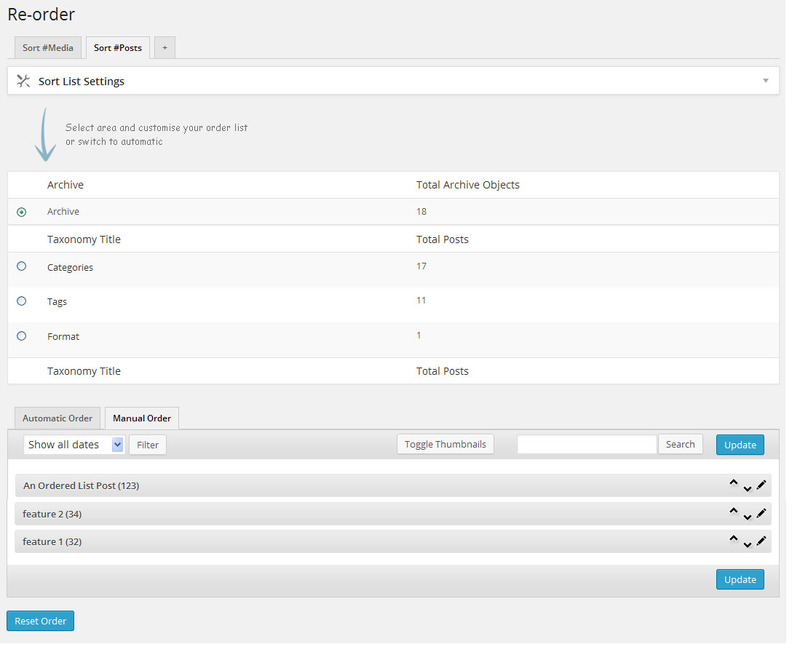 Per above example image, the Re_order interface has been set to show up for Posts and Feature admin menus. This is how the new menu item appear. Any sort list can be deleted anytime or moved to another Re-order interface from Sort Settings > Menu Location (see Understanding Sort List Settings Area for additional descriptions. Also when a Re-order interface is set for Hide from plugin settings, any existing sorts will be relocated to the nearest visible interface. In case of multiple sorts of same type (i.e. containing the same post type) if there are no conditionals to make a difference, the first sort will apply.